The increasing sophistication of chatbots can help companies connect with their customers better, especially because of their ability to mimic human-like conversations. The digital revolution is transforming the way customers connect with businesses. This is particularly relevant for retailers, many of who provide online, mobile, and in-store engagement options. Customers want real-time access to products and services regardless of their location and what device they are using. Delivering great customer service experience is a significant competitive differentiator. 87% of customers report that the customer service they receive plays a pivotal role in their decision to do business with a company. 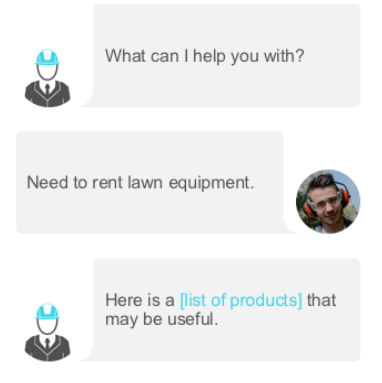 Conversational AI is a real game-changer when it comes to enhancing customer experience. Conversational AI solutions such as chatbots use natural language processing (NLP) technologies to transform the way customers interact with brands. They reduce the communication bottlenecks between people, systems and things by replacing IVR and GUI-based interactions with natural human-like conversations. Shoppers want quick and easy ways to find the right product or service and get the best deal. Similarly, there are consumers that prefer self-service channels that instantly answer their questions or solve their need. On the other side, retailers need to maximize their digital and in-store offerings to foster loyalty and drive shoppers to purchase. Well, that’s where chatbots come in, and transform the online shopping experience in a big way. Typically, bot conversations are bi-directional and every user interaction is tracked, bot-facilitated communications and offers are natural and contextually relevant. They’re also proactive, anticipating what the customer wants or needs next. All of this humanizes the sales and customer interactions, and transforms both the in-store and digital shopping and customer service experiences. More over, with e-commerce bots, stores can offer 24/7 customer support to the shoppers, track orders, quick delivery, track customer behaviour and data- all through machine learning. Bots automate many human tasks and can allow customers to search for any kind of product or interact with a brand. Here, the bot gives product recommendations and allows the shopper to browse the catalogue. The customer can ask for a particular product, and pick up after comparing various products per his liking. The bot creates a full shopping experience for a shopper. For example, here not only the bot creates an entire grocery list for a week but also enables the user to search for featured recipes of the week. 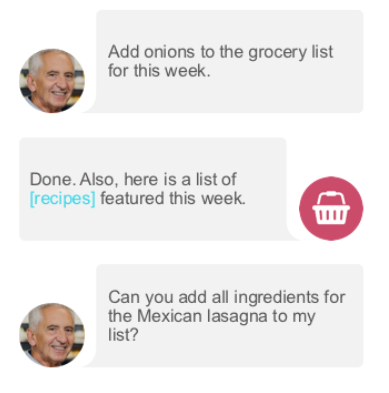 Also, the user can ask the bot to add the required ingredients for making their favorite dish to the created grocery list. E-commerce bots makes everything so special for you. Like here, the bot has learnt user’s preferences based on the past purchases or information she provided at the time of onboarding, and is offering gift packages to mark an anniversary or any special occasion. 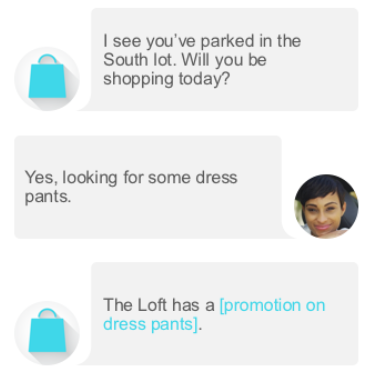 The bot learns from subsequent chats, online shopping habits, and acting as a personal shopping assistant recommends places to shop from depending on the user’s current location. 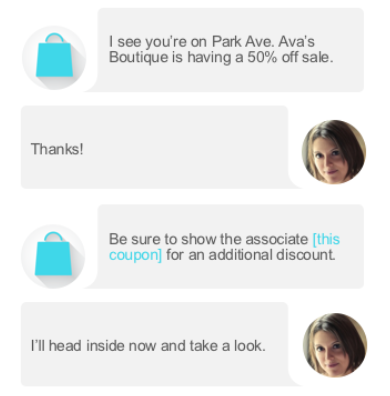 For example, when the user is at Park Ave, the bot sends messages about sales in a nearby store and also notifies her for an additional coupon to get a discount on her purchase. The bot guides the user where to shop for some dress pants depending upon her location. 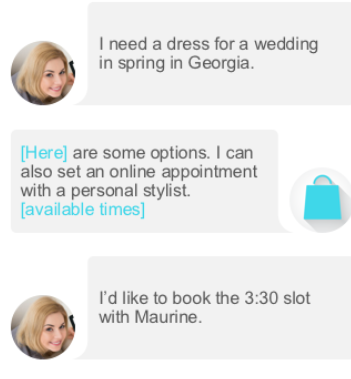 One of the most interesting facts about the chat above is that the bot recognizes the location of the user and asks her about any shopping she would like to do. And then recommends her a store that suits her interest. Here, the bot makes customer interaction easy and comfortable. The bot’s response is rather fast as the user starts searching for an associate. It not only locates the user but also sends an associate for help. After that, it searches for coupons on health drink as asked by the user. AI-powered bots are shifting the contours of e-commerce landscape by making the online shopping experience more natural and human. Kore.ai helps you optimize your digital strategy with its enterprise-grade bots platform for building and customizing intelligent bots that can be integrated with multiple channels, ensuring users a great experience. 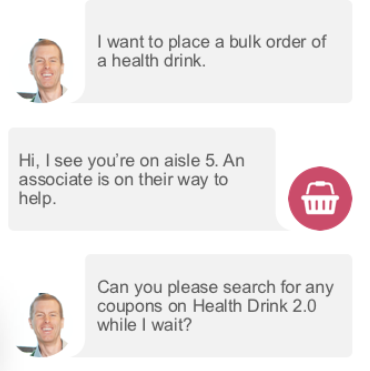 To learn more about our chatbots in retail, read the retail executive brief.